[Editor's Note: The following story was taken from the Sep 5, 2005 Implosion Group Newsletter ( url below). 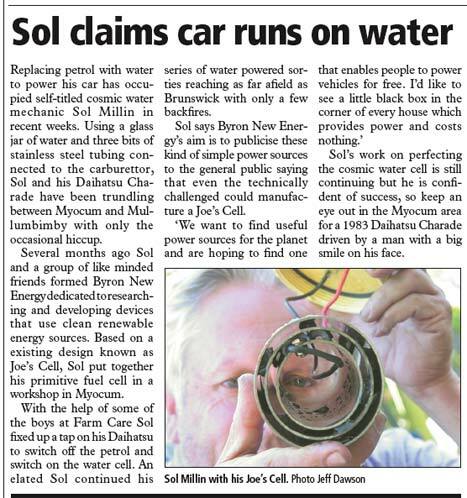 In early 1998, I wrote an article explaining the Joe Cell ( http://educate-yourself.org/fe/fejoewatercell.shtml )after viewing two amateur video tapes of Joe made by SciAstro, an Australian group of free energy buffs. The Joe Cell books by Barry Hilton and Alex Schiffer filled in many areas of uncertainty or confusion from Joe's initial notions of how the cell worked. I wanted you to read the article below because it's important to see that ordinary people can get the Joe cell to work. Many people who write to me about the cell always want to know who else has a working cell. Well, this guy, Sol Millin, got it working. Sol has followed the most important details to get a Joe cell to work. First, he's using a 1983 automobile that uses a carburetor with ignition points and an ignition coil. The ignition coil is a Tesla coil and it's RADIATING an electrical AND a magnetic field (including a 4th dimensional aspect) that can penetrate the walls of the engine and permit the implosion action to take place within the cylinder-which could allow the cell to operate WITHOUT spark plugs (but that's not the case here). Second, he's made a small version of the Joe cell as shown in the Joe cell videos. It does not have to be large or fancy or expensive. He's using three stainless steel cylinders, rubber grommets to separate the cylinders, a glass jar to hold the water and he uses a plastic PVC top and piping to funnel the gas into the car. Note, there are two wires connected to the inner and outer cylinders which connect to the battery to start the cell breeding, but once the cell begins to breed, you can disconnect the battery power and it will continue to breed. Sol started the cell breeding on his bench and then let it seed overnight, carrying it out to the car-while it's breeding. If you read the story carefully, that's what he's explaining to the reader (important remarks are highlighted in bold print for clarity). He installed a simple, in-line switch to cut off electricity to the electric fuel pump once he got underway with the Joe cell breeding and in place. As far as I can discern, he hasn't made any other changes to the car, not even advancing the timing (which will produce better power using a Joe cell) When you read that he switches the car off, he's turning off the ignition key in the usual way and turning it on again in the usual way. Turning off the key stops the ignition coil from radiating its electromagnetic field and that stops the implosion action in the cylinder. When he starts the car again, the ignition coil field is instantly re-established and you once again get implosion in the cylinders. The Joe cell continues to breed whether the car's ignition key is turned on or off. Later in the article, Sol disconnects the fuel line altogether and, of course, the motor continues to run (as explained in my Joe cell article). When Sol and his pals pull off the plastic pipe feeding the engine from the Joe cell, then naturally, the engine gradually puttered to a stop ( Auzzies will try ANYTHING to satisfy their curiosity-- but thank God for such innocence). The most interesting part is the last section of the article. Sol and Ian visit a skeptical friend named "Chris" to show him how the engine is running on water. They disconnect the fuel line to demonstrate to Chris that it's running exclusively on the Joe sell, but Chris is still skeptical. They agree to go on the road in two cars so Chris can observe the cell in action. Ian says to Sol as they head out on the road that "they're being followed by a disbeliever (Chris)" and the car dies then and there. Today, 17 August 2005, started as per normal with a cheery hello to Chris where we have the BNE (Byron New Energy) Lab here in Byron. I was doing my chores when I had a feeling to ring Joe, which I did. We had a great talk and at the end of it my BNE buddy Ian wandered into the kitchen. We made a cup of tea and I recounted some of the things that had been happening (Ian gets the emails, so he already knew) and then we wandered into the lab so Ian could see the cell. The previous night, I had been giving some thought to the misfires and instability of the cell on the previous day and as I'd experimented with sodium hydroxide as an electrolyte (pretty powerful stuff and really chews into stuff especially aluminium, hey by the way that's another way of making hydrogen. Drop a piece of aluminium into a solution of sodium hydroxide) I considered it carefully and decided to put just a teeny weeny little bit of sodium hydroxide into the cell to see what would happen. You see sodium hydroxide increases the electrolytic processes in water enormously, and as I haven't got a clue how this cell is working and being an experimental Cosmic water mechanic I thought I'd just try it. Caustic soda is very easy to come by and dirt cheap. I had purchased some at the local hardware store. Zoooo. I took a leeetle bit (physically it is in small white granules far less than a millimeter in diameter) a soup song as they say in France, maybe about 200 minute granules and wacked in in the cell well, actually slowly spooned it into the cell while connected to my 12 computer power supply on the lab bench. Wow! Talk about action. The current running through the cell went up from 130 milliamps to about 2 amps (still only 2 x 12 = 24 watts which is chicken feed for a car battery and a computer power supply if it comes to that). Then I had to think carefully, since this stuff is as they say in the classics 'not good for engines', however, since my beautiful little Daihatsu Charade al la 1983 vintage had cost me $100 to buy ($840 all up when registered and insured for a year) I thought, what the heck! All in the name of science. Anyways as they say in the US of A, we decided to give the cell a test. Ian had never seen it before. He carried it reverently out of the workshop (actually, come to think of it, Ian's not really the 'reverend' sort of type, more sort of surfy dude I'd say) and I showed him how to connect it into the car. We didn't put power on the cell (ie. left it disconnected from the car battery) and drove out of the lab property on normal fuel. After closing the gate, I showed Ian how to switch off the normal fuel which we did and off we went to Mullum (with me holding my breath, since she'd not worked that well in the later part of yesterday). Well she started off down the main road to Mullum, missed a few times, backfired a few times but would you believe!!! kept going. Ian sat there in stunned silence 'Hey man! It's working' I said happily You're running on water! There was this absolute look of total disbelief on Ian's face I was real happy because Ian is the first person I've had in the car with the cell working We beetled into Mullum (bimby) the motor was going much better now apparently the cell 'acclimatizes' itself to the engine and the car and another thing apparently it goes better with the timing advanced (Peter said even 20 degrees!). I haven't fiddled with the timing yet, not knowing much about cars and engines myself. So the timing was 'as is' with normal fuel. We purred through the main streets of Mullum to the Post Office where Ian had some businesses and parked normally with the engine idling perfectly. Ian just could get over it he just sat there in a daze. By the way, the temperature of the motor was as per normal. 'Shall I switch it off and try and start it?' I asked. Ian nodded vaguely. The car went beautifully. When we got into the 100 kph zone outside Mullum, as we got up to 80 kph I said to Ian, 'I've not taken her over 80 kph yet, so I tried accelerating but felt a slight drag on the motor, so felt it may be the timing and decelerated back to 80 kph. I've never actually got the car up the hill on McAuleys Lane on water before, but today she purred up the hill. 'Geeez! I'd love to show Chris this' I said to Ian, still sitting there in a daze. We got to the gate and she still kept running. Hey! This is something new! The gate was open so we drove straight in. Chris was there doing business with a courier and got a bit upset with us as he thought I was going to run over his 5 dogs (which I wasn't). We parked the car and opened the bonnet with the motor still running. Now, you've got to know Chris. Chris is as dour as it comes let me tell you. They don't make em more dour than Chris. From Nottingham you know says he's a plumber lived in the district for yonks. Now Chris does not believe a word I've been saying, (and I don't blame him) but he does allow me to continue experimenting which I really appreciate (thanks Chris), 'Hey Chris, it's running on water right now, come over and have a look!'. Chris wandered over more interested in his parcel than anything else. 'Look Chris, see it works!' Chris peered into the engine compartment, looked at the cell, and followed my finger to the switched off normal fuel switch' 'That switch is leaking' he said with a cunning smile on his face. 'OK we'll pull the pipe off', I said. Which with a bit of a struggle we did. She kept purring on as if nothing had happened. I don't know what was going through Chris' mind. 'I wonder if you can disconnect the pipe from the cell to the motor', Ian said. 'Let's try it! ', I responded and Chris pulled the pipe apart. Now wait for it. You're ready? OK.
She ran for quite a time and then stopped I decided to switch power onto the cell (in case it had discharged) and she started again. I think by now I was getting just a bit too excited. She ran for a while then stopped again. I could feel my energy getting confused and exhausted by now, but I wanted to keep going. 'Let's drive to Mullum with the fuel totally disconnected'. We reconnected the plastic pipe between the cell and the engine, and Ian jumped in the car and we reversed up and out of the gate with the normal fuel totally physically disconnected. We heard Chris' car start up so we waited for him to come out of the gate and Ian closed the gate for Chris and off we went. As we started out for Mullum Ian said 'We're being followed by a disbeliever'. As the words came out of his mouth, the engine failed.